Amador Fernández-Savater speaks to Catalan-Mexican writer and activist Guiomar Rovira about collective action, technologies, the online, “off-life” divide and more. After the fall of the Soviet Union in the mid-nineties, there was much talk of pensée unique, singlemindedness or “single thought”: a discourse affirming market democracy as the only imaginable and discernable framework for common life. As Noam Chomsky would caution, the only strategy for assuring the uptake of this narrative would be the concentration of information and media, meaning, the consolidation of the voice and the imagination of what is possible. It was the belle époque of neoliberalism. In her book, Networked Activism and Connected Multitudes (Activismo en red y multitudes conectadas:Comunicación y acción en la era de Internet), Guiomar Rovira tells the story of how that unitary discourse was questioned to open up new possibilities. It began with the emergence of activist networks that, taking advantage of the internet’s open and decentralized infrastructure, created new technological tools to share images, words and feelings distinct from the official narrative. These were the times of Zapatismo and anti-globalization. Later, with Web 2.0, the politicized use of networks became socialized, providing access to anyone. This was the time of connected multitudes, including 15-M and other movements spawned by the crisis. Guiomar’s account distinguishes itself from regular academic production in two ways. To begin with, the book is fundamentally affirmative, rather than critical. It affirms the political power of technologies once people have seized their ownership. The author does not view the world from the angle of power: she does not reinforce our impotence, or how dominated and manipulated we are, nor does she victimize us. On the contrary — she speaks about what’s been done, what’s being done and what can be done. She contemplates the world from the perspective of potentiality. Secondly, it is a lived book. The author’s personal experiences – through punk, Zapatismo or Mexico’s #Yosoy132 movement – form a basis for reflection. Guiomar Rovira is a Catalonian journalist and writer living in Mexico since 1994. She is the author of numerous essays and a teacher in Mexico City’s UAM-Xochimilco University. Amador Fernández-Savater: “Activist networks” is how you characterize the first historical period described in your book. One of its fundamental ingredients was punk, something that you personally experienced while living in Barcelona during the eighties. How did punk influence the creation of these networks? Guiomar Rovira: I like it that you want to start there. “No future” is one of the most important messages in punk. In a way, contemplating that “there is no future” opens up a new politics, a much more prefigurative politics. It’s no longer a question of waiting and dreaming of utopias, but of doing what we need to do here and now, and in the ways we can and want to. We’re not waiting for further instructions or permissions to get started. We will take ownership of music and spaces. In punk, anyone can pick up a guitar while someone else starts singing, speaking, doing. This is where we find the DIY spirit, with whatever you have at hand. The cultural becomes political: it is a way to exit the defined boundaries of the system that constantly procrastinates and sacrifices in service to the promise of a non-existent future. In that sense, from fanzines to squatting, punk is very rich. There is no future, so we have to live. Now. There is no housing, so we have to squat buildings. It’s a movement that also becomes transnational, not embedded in state or national structures but in the spaces in the cities, in the creation of networks. An extended sense-making community. A global movement with its local appropriations, one that needs not ask permission to build a politics and ways of making culture and communicating. A movement where anyone can say what they want to say. In a way, punk prefigures the hacker mentality. At that time, I was part of a magazine called Lletra A. We made it by cutting and pasting the whole thing manually. We also had a very important network for occupying houses in Barcelona. We opened our modest self-organised social center, el Anti. The idea was, “there is no future, let’s build our lives now”. It wasn’t limited to counter-information, it was about creating a distinct ecosystem. Amador: There is a second social movement that would be central to the creation of those activist networks. I’m referring to Zapatismo which, unlike punk, wouldn’t be a “dark” movement. Zapatismo opens a horizon of hope, removed from the metropolis. What can you tell us about the relation between Zapatismo, technologies and communication? Guiomar: We have to take into account that in 1989, the Berlin Wall fell, and we lived in a unipolar world marked by the “end of history”. But suddenly, from the most surprising and unexpected place, there is rebellion, hope, and a movement that speaks to us, and where I found myself. I feel that the significance of Zapatismo is that it allowed for a global common framework. This was a moment marked by despondency across all struggles: the global left was despondent, the Latin American guerrillas were in the doldrums, and so on. Suddenly, an interpellating framework that rescued us from isolated processes of resistance was born. A framework for active mobilization that allows many different struggles to have a shared sense of identity and a common foe. It is humanity against neoliberalism, the Zapatistas say. And who proposed this framework? The indigenous peoples of Chiapas, the most forgotten, the smallest, coming from a corner of the world where many weren’t even aware that there were indigenous communities, or resistance, or the possibility of struggle. This was still a global media event, accordingly relayed by traditional mass media (newspapers, radio, television). The World Wide Web was barely a year old, hardly anyone was using it. After a few days, though, the newspapers and radio dropped the story. Nevertheless, people sought ways to keep abreast and intervene in what was happening in Chiapas, supporting this rebellion as a locus of hope for the world. Amador: This is when the appropriation of the Internet takes place. At that time, it was a new means of communication. How did that come about? That is how information began to be shared and an informational scaffolding was built around the situation in Chiapas. This was huge: at that time the Mexican government was still quite invested in pushing a positive image internationally (that is no longer the case). But information was not the only thing circulating; many people were travelling to Chiapas, visiting the communities, and generating even more information. There were inputs and outputs, a communicative atmosphere supporting an indigenous rebellion and indigenous rebellion proposing the idea that another world is possible. An interpellation finding resonance in many places around the world and allowing for common action, aside from any differences in our ways of doing. Amador: I want to pose a question a bit beyond our conversation about activist networks and connected multitudes, about the support you find in the classic author Walter Benjamin. What is it about Benjamin, what kind of ally is he? Guiomar: What I find in Benjamin is a profound metaphorical, poetical and political inspiration. In the darkness of his time he was able to see the light, more so than any other member of the Frankfurt School. Benjamin helps me understand this need of mine to find the power in each moment, each place. Technique is not our enemy. It also represents the possibility of living in a fuller world, where our covenant with nature is not hostile, nor does it force the violence by which we survive or perish. Predatory capitalism, based on artificially created pain and scarcity, undermines the potential of technique. The blame for the expulsion of life and accumulation through dispossession lies not with the Internet, but with a montage, a global system, that takes technique and, rather than put it in the service of humanity, gifts it to capitalism and the predatory production of scarcity. Benjamin invites us to conceive of another, non-capitalist modernity. In The Work of Art in the Age of Mechanical Reproduction, Benjamin sees the democratizing possibility enabled by the fact that we can all take ownership of technique, become authors, and have fuller lives, our own voices. There is another idea of his, which appears in Theses on the Philosophy of History, the concept of jetztzeit: the radiant moment that constellates a kind of epiphany in the here and now where everything opens. This is the idea of the constellation, which I keep coming back to in the book. Those that precede us implore us to see that justice is done. At the same time, there isn’t a single genealogy for all movements. Rather, every movement constructs its own history, shines a light on its radiant moments and, from there, articulates its own destiny. It is a tremendously creative way of understanding that the political also represents an opening to the past. Benjamin is an inspiration. He died in Portbou, my grandparents’ village. This summer I went to see his grave. He lived a terrible life and never achieved the recognition he deserved. Still, he was the most optimistic, the most creative of the intellectuals of his time. It’s ironic that the one who suffers the most is more able to see the openings, the possibilities, the power. Connected Multitudes: Technology in anyone’s hands. Amador: First there is networked activism, the appropriation of technology by activists (punk, Zapatismo, the anti-globalization movement), but then there would be a second movement marking a radical transformation from networked activism, which would be the “connected multitudes”. I would like you to tell us about that transition. Guiomar: The communicative environment of networked activism remains permeated and populated mainly by militants — people with political consciousness. The shift to connected multitudes is highlighted by the fact that the leading voices are no longer limited to those coming from activism. Anyone using a social network has a voice, without necessarily having been previously politicized or part of any specific activist space. And this can happen in politically incorrect spaces like Twitter, or Facebook or YouTube, which are privative networks. For example, take Mexico’s #Yosoy132 movement. 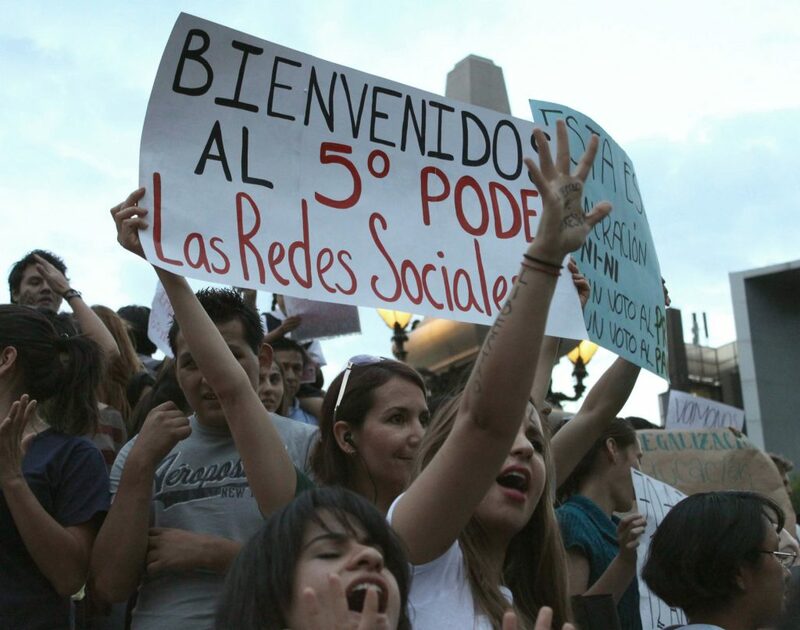 Not all the Ibero-American University students that started the protests were already politicized, but they did feel aggravated, and used tools to voice that discontent and be heard in the media after remarks were made about president Peña Nieto’s visit to their University. The video they uploaded to YouTube had impressive consequences, generating a wave of indignation that many sorts of people felt identified with. Everybody wondered how it was possible that such an important movement hadn’t come from the UNAM, or from the groups that had been cutting their teeth for years, denouncing unjust situations. Instead, this came from a totally unexpected, unpredictable collective. In those protests we see a phenomenon that Manuel Castells calls Mass Self Communication: everyone becomes an information producer, a remixer, a retweeter. Everyone takes part in conversations and strengthens the movement with his or her own ability, for example, graphic arts. The processes of putting out and taking in become fuzzy; the entrenched notions of origin, authority and attribution become somewhat “lossy”. Amador: The book highlights the positive character of the shift between these two stages of alternative communication. This is a process of democratization: if networks had previously been in the hands of activists, now the political use of technology is in the hands of anyone. But, doesn’t this mean that we’ve also lost sight of the importance of technological infrastructures and technological sovereignty? These elements, crucial to the hacker mentality, seem to have been sidelined in favor of “ease of use” in the distribution of content, thanks to social networks made freely available by the same system we are trying to undermine. Guiomar: While what you’ve mentioned is undoubtedly important, I can’t fully agree with your assertion of what it is we’ve lost. I think that we’re shifting from a very uninformed and automatic use of networks to a more conscious usage due to the Snowden or Wikileaks revelations on spyware. I think that we’re seeing the emergence of a new movement that is far more aware about surveillance, control and data appropriation in social networks. This awareness is something new and we’ve reached it thanks to the work of certain hackers. I see Snowden, Chelsea Manning and Julian Assange as hackers. They’ve shown why we need to be careful and use Tor, use free software, why we need to have secure passwords and use the web responsibly. We’ll see what comes of that. Amador: Instead of intellectuals raising a finger to tell us: “be careful, this is not going well”, what we need is more social appropriation of technology, more learning, more technological literacy, more hacklabs. I think that this is one of the key messages in your book. You acknowledge that the Internet is taking a somber turn, while asserting that the solutions will not be found outside the Internet. Guiomar: Discursive critiques of technology never solve anything. How can we teach ourselves about sociability in networks? By appropriating spaces, constructing them collaboratively, sharing what we know…by doing what we feel like doing, in ways we feel like doing it, and generating new ways. This is what, in my book, I describe as “hacker unfolding.” This is not just a technological possibility; to me, the concept of hacking goes far beyond technology. The hacker takes something apart to then build something new, deconstructing what is offered as a black box to open new possibilities. And this is not limited to technology, it can be done anywhere. Widen your scope and construct new potentials, whether it’s in the university, or in human relations. As Fernanda Briones, the hackfeminism expert, says “Let’s do it together”. Amador: How do you consider of the relation between technology and bodies, between the world of bytes and the world of atoms. Guiomar: My position is that, beyond the differentiation between online and offline worlds, everything occurs on-life. Seen this way, the corporeal experience of encountering is the key. Going out, looking at each other, experiencing the body-to-body connection. Physical encounters, opening spaces for emergence, experimenting with the body’s vulnerability, all of this is essential. The very logic of networks stresses the commonality of how impossible it is to live under the conditions imposed by this expropriating capitalism. This encounter is the quintessential political moment of our times. To me, this dimension that deals with the vulnerability of the body, this exposition, has transformed voluntary activism into something more alive, less predetermined. The body becomes visible; it interacts and creates convivial, caring spaces while simultaneously politicizing what is private. My current thesis identifies a feministization of connected multitudes, a kind of free appropriation of feminism, a feminism that becomes inevitable. No emancipatory movement can ignore the widely varied approaches to women’s struggles and feminist struggles over the course of time. All of this happens through the body. Bodies in the street and communication through networks; I can’t think of these as separate. We are a type of cyborg: we carry our own technological extensions. When I think about politics, technology becomes part of collective action. It’s not something additional, or different. If you pay attention, the most important cyberspace and network actions have always taken place within a context of street mobilization. Acting is communicating and vice versa. Everything happens in the on-life dimension. Our brains are the ultimate platform. There is nothing non-physical. The idea that networks are beyond physicality is just dead wrong, and I have put my mind to opposing it. This text was transcribed from an interview during Guiomar’s book launch. It took place on September 19, 2017 in UAM-Xochimilco. The original Spanish interview was transcribed by Gerardo Juárez and edited by Amador Fernández-Savater. Pensée unique, a term coined by French journalist Jean-François Kahn refers to hegemonic ideological conformism. See the Wikipedia entry for more. Universidad Nacional Autónoma de México or National Autonomous University of Mexico, one of the world’s highest ranking University in R&D. See the Wikipedia entry for more. “Hagámoslo juntas” in the original. Spanish is gendered, “juntas” is the female form of “together”. Female (as opposed to the “default” male) grammatical forms have become more commonly used after the 15M movements, such that people of any gender identity more frequently choose to use the female form to describe mixed gender groups. Republished from Guerrilla Translation under a Peer Production License. I’m really excited to read the authors perspective on the Internationalist Commune of Rojava and how p2p and Democratic Confederalism relate!